JOE K: The original hard cover was black and white painted by artist Paul Bacon for Bantam Books. It was a more simplistic version of the iconic image featuring a white translucent shark veering up towards a swimmer painted in the same style. The shark had no eyes or teeth, just the recognizable shape of the shark’s head and mouth. When Bantam released the book in paperback, they revisited Bacon’s image. They hired artist Roger Kastel to use Bacon’s hardcover image as a starting point, but they were suggesting Kastel to make the image a bit more realistic and of course menacing. Kastel did such an impressive job that Universal Studios chose to use that image for the iconic movie poster. BUDDY: Why do you think they selected the iconic version? Why does it work? JOE K: There are so many reasons that this image works! First, even if you were living under a rock and never heard of JAWS, you could tell just by the image what is happening: Very large shark about to prey on unsuspecting swimmer. The image is unbelievably simple, yet so captivating at the same time. The use of a basic color palette of red, white, blue and black (with minor shades of pink for the swimmer’s skin) keeps the visual noise down (notice there’s no sky above the surface?). The movement that is created by the simple brush strokes around the swimmer’s arms and legs to show splashing, and the bubble around the shark’s mouth to show it’s speed as it swims toward the surface is quite impressive considering it’s a two dimensional image. The use of black to accentuate the shark’s teeth and cavernous mouth was a win, not to mention the cropping of the image inside that thick black border to strengthen the focal point of the ferocity of the shark. BUDDY: Color can be used in any number of ways. We can use real-world colors like they did in this piece or a completely different color palette. It feels like the real-world colors make this piece feel more urgent and real, even though the actual design is completely fictional. That is, at the time, it would be almost impossible to capture this shot, yet with the real world colors, it feels plausible and exciting. What do you think? I totally agree, Kastel did a fantastic job of capturing an exciting moment that would have been close to impossible to capture with a camera in the early 70s. He did his homework by visiting natural history museums that had shark exhibits to study the actual shape and structure of the mouth and head. He actually hired a model to lay across a stool in his studio in a “swimmer’s position” to capture the body movement of a swimmer from the water level angle. He took the pieces and put them together in a somewhat realistic painting. He also used what I would refer to as “real world colors on steroids.” Case in point: When you watch any shark program on all of those nature channels featuring Great Whites, with see why the shark earned it’s name… because it’s big and white. But in the painting, Kastel captured the environment of being underwater, but mostly kept the shark the same shades of blue as the water, only adding some highlights to give the shark’s head some depth. I believe that this was done to really draw your eyes to the darkness of the shark’s mouth. BUDDY: I recall you saying that the original concept was for a different title and even a different image, perhaps something more abstract. How did the promoters use this movie poster to market the movie? BUDDY: We address visual storytelling in the main post (link to). 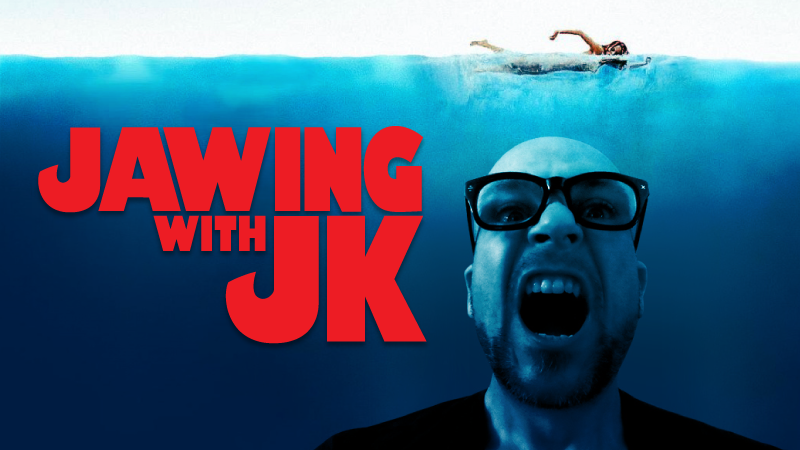 What can content marketers learn from the JAWS movie poster that may help them improve their visual storytelling? JOE K: Many things! reducing visual noise and focusing on the topic is always a good thing… simple and straightforward is always beneficial. Marketers only have a matter of seconds to capture the attention of their audience while they are rolling through their various news feeds, so keep that in mind as you are creating your visual content. What is your focal point? What message do you want to convey? Like the jaws of the iconic shark, what can you do to make your audience stop and say, “whoah!”? BUDDY: And how can movie-poster design be part of a content marketing strategy? JOE K: From the functional standpoint, movie posters are meant to draw the audience in. They are aesthetically pleasing and meant to highlight point of the film, to entice the audience as they walk by. That is where a marketer could tie in the movie poster theory to a content marketing strategy. What highlights of your content could you throw out there to pull the audience in? Do you have some aesthetically pleasing visuals that you could create to promote your content? 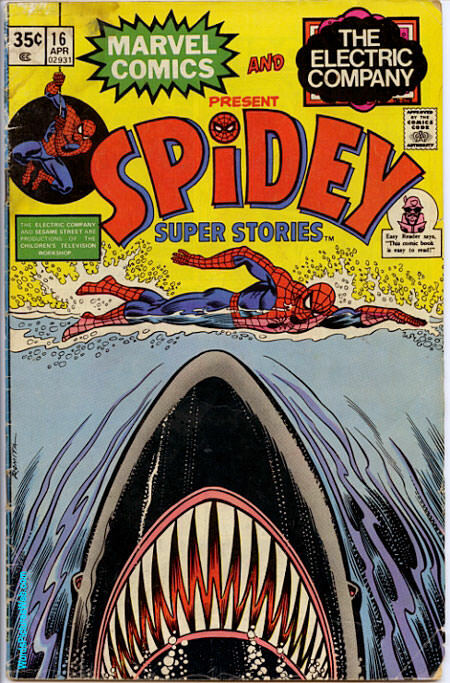 And since you made it all the way to the bottom of this post, here’s a bonus image of Spider-Man swimming from the Jaws shark. The day we were completing this post, I found this at a flea market. Pretty awesome, right? This entry was posted in content, content strategy, creativity, Marketing, visual content marketing, visual content strategy, Web Design and tagged content marketing institute, joe kalinowski, movies, storytelling, visual content strategy, visual storytelling by Buddy_Scalera. Bookmark the permalink.